Do We Really Want Better Intelligence? Terrorists have been stopped since 2001 and plots prevented, but always by other means. After the Nigerian “underwear bomber” of Christmas Day 2009 was foiled, DHS Secretary Janet Napolitano claimed “the system worked” — but the bomber was caught by a passenger, not the feds. Richard Reid, the 2001 shoe bomber, was undone by an alert stewardess who smelled something funny. The 2006 Heathrow Airport plot was uncovered by an intelligence tip. Al Qaeda’s recent attempt to explode cargo planes was caught by a human intelligence source, not an X-ray machine. Yet the TSA responds to these events by placing restrictions on shoes, liquids, and now perhaps printer cartridges. Given this reality — and given that 9/11 was, above all, a massive intelligence failure — wouldn’t we be safer if the vast budgets of TSA and its partners around the world were diverted away from confiscating nail scissors and toward creating better information systems and better intelligence? Imagine if security officers in Amsterdam had been made aware of the warnings the underwear bomber’s father gave to the U.S. Embassy in Abuja. Or, for that matter, if consular officers had prevented him from receiving a visa in the first place. This is conventional wisdom these days, as near as I can tell, so no points for originality. But it raises a question: we all hate TSA’s physical security procedures, but the fact is that we don’t much like the idea of tightening up TSA’s non-physical operations either. 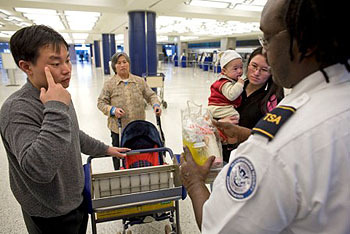 Several years ago, Congress told TSA to screen passengers more tightly, and the result was expanded watch lists, expanded no-fly lists, and the proposed CAPPS system, which was designed to identify all passengers and cross reference them with government records and commercial databases to produce a “risk score” that indicated the appropriate screening level for each traveler. Needless to say, everyone screamed about this, so it was scrapped and replaced by a more modest system called Secure Flight. But if physical security is mostly eliminated, it seems inevitable that it will be replaced with beefed up intelligence and surveillance operations, as well as beefed up tracking of individuals a la CAPPS. But if that’s what we get, I wonder if we’re going to like it any better?